A candy thank you is a sweet way (in more than one way!) 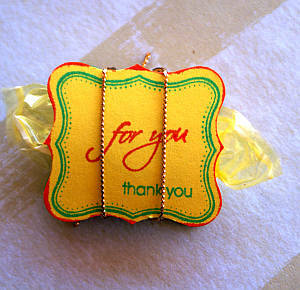 to thank someone for their thoughtfulness or kindness, and dressing up candy your own way makes it even more special. Sometimes a person is just so nice. I really feel I want to thank people quite often for their kind words, kind thoughts, kind actions. I wanted to thank a bunch of people recently by sending them a little something through the mail. As summer was coming I didn't want to send chocolate in case it melted along the way. Then I got my Curly Label Punch Bundle (retired) and I knew what I could do. I could make Candy Thank You favours. So I did. And now I want to share them with you. 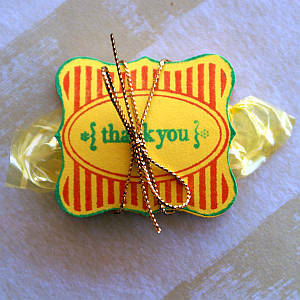 Here's a way to make a Candy Thank You favour as a sweet treat. but for you my heart has no bottom". Why not share some sweet favour examples of your own? You can post them to PaperCraftCentral by scrolling to the bottom of the page where there is an upload box. First I gathered my tools. 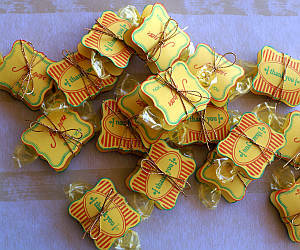 I needed some hard candies (I chose Werther's Caramels) the (now retired) Curly Label Punch Set from Stampin' Up!, some cardstock and inks, a spool of gold cord and some Stampin' Up! mini glue dot. 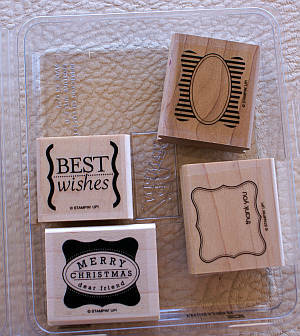 Stamp your labels and sentiments out on a piece of A4 cardstock. I chose Yo Yo Yellow (retired) cardstock, Pumpkin Pie ink and Tempting Turquoise ink. Apply a glue dot to the wrong side of each of the labels. I worked with two at a time so I didn't wind up with a bunch of labels sticking together on my craft desk - lol! The glue dots help with the next step. Cut a piece of gold cord about 30cms (12") long. 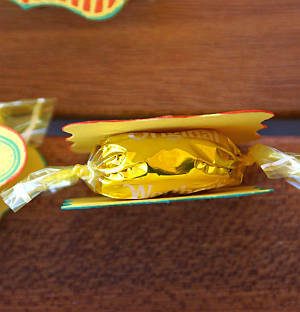 Wrap it around the sandwiched candy and labels. You will find there are little notches in the labels you can use as a guide for placing the cord evenly around the candy. 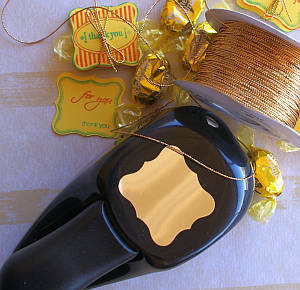 Tie in a bow at the front then trim the ends of the cord to more or less line up with the edges of the label. Having a longer cord helps you tie the bow without feeling too frustrated by the task, but if the ends are too long after you tie the bow then trim them so it looks 'right' to you. You're done! Now just repeat as many times as you wish and make yourself a bunch of sweet thank you treats! I hope you will let me know if you make any of these little treats. Imagine the possibilities! You could use them favours for weddings, birthdays, Valentine's Day, Christmas, or any other special occasion where you wanted to give someone a little something special and unique. Just customise your stamps, card stock and inks to match your occasion.